Happy Sunday and happy Easter Sunday to those who celebrate. 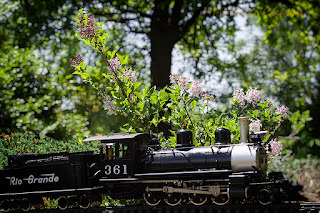 This is an image from last year because the miniature Lilac has yet to bloom. I thought it appropriate for the day though, a steam train with flowers from my garden railway. 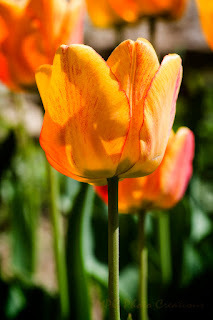 I am on a flower roll with my celebration of Spring. It's so lovely to see everything coming to life and being so colorful. This is a closeup of the other variety of Tulip that I have with the Reds with yellow accents. This type is yellow with red accents and they compliment each other well. I love how they seem to glow in the sun. Another thing that has been in bloom this spring are the Ornamental Pear trees. The white blossoms from them combined with the pinks from the Redbuds really makes it lovely in our area of Kansas. 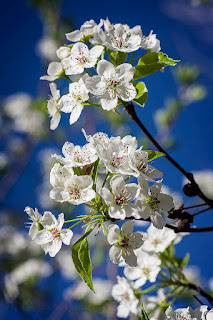 Plus the Crabapples are beginning to bloom as well so it is quite colorful right now. I found on the new land that I have several Pear trees. 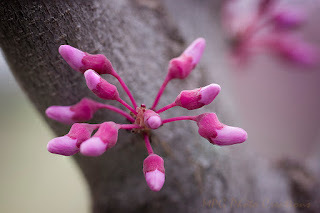 These are the blooms from one of them and I loved the bokeh that others created behind. Posting early because I am going to try out writing these the night before and then having them post the next day. Not sure how I will like that as there may be something I want to mention but we shall see how it goes. 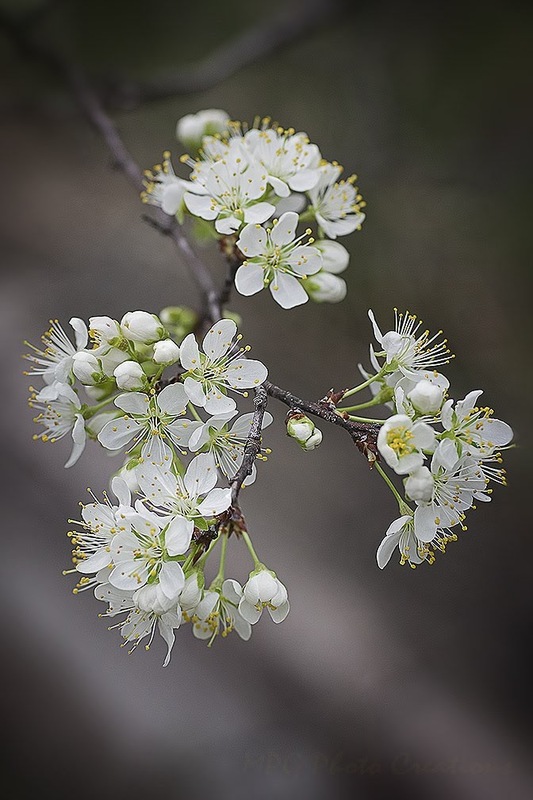 This is a close up of the Wild Plum blossoms. I love them, so delicate and and pretty and smell very nice. I can see why the butterflies are attracted. I am not sure if this is something you usually want to see in your backyard or not. 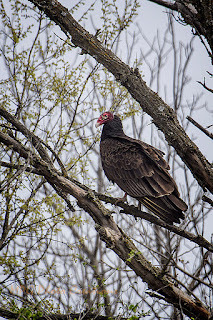 😘 I looked out the window of the bathroom on Saturday morning and there were 3 Turkey Vultures sitting next to each other in the tree. By the time I went and got my camera, only one was left and it flew off after I got a couple shots. Happy Tax Day! Hope you got them done and in. 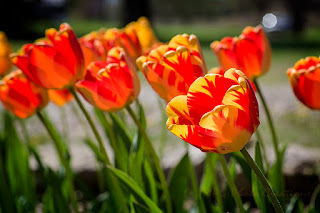 My Tulips are blooming well. I love to see them, so bright and colorful. I like this variety with the yellow highlights.